The AdS/MERA correspondence has been making the rounds of the blogosphere with nice posts by Scott Aaronson and Sean Carroll, so let’s take a look at the topic here at Quantum Frontiers. The question of how to formulate a quantum theory of gravity is a long-standing open problem in theoretical physics. Somewhat recently, an idea that has gained a lot of traction (and that Spiros has blogged about before) is emergence. This is the idea that space and time may emerge from some more fine-grained quantum objects and their interactions. If we could understand how classical spacetime emerges from an underlying quantum system, then it’s not too much of a stretch to hope that this understanding would give us insight into the full quantum nature of spacetime. One type of emergence is exhibited in holography, which is the idea that certain (D+1)-dimensional systems with gravity are exactly equivalent to D-dimensional quantum theories without gravity. (Note that we’re calling time a dimension here. For example, you would say that on a day-to-day basis we experience D = 4 dimensions.) In this case, that extra +1 dimension and the concomitant gravitational dynamics are emergent phenomena. A nice aspect of holography is that it is explicitly realized by the AdS/CFT correspondence. This correspondence proposes that a particular class of spacetimes—ones that asymptotically look like anti-de Sitter space, or AdS—are equivalent to states of a particular type of quantum system—a conformal field theory, or CFT. A convenient visualization is to draw the AdS spacetime as a cylinder, where time marches forward as you move up the cylinder and different slices of the cylinder correspond to snapshots of space at different instants of time. 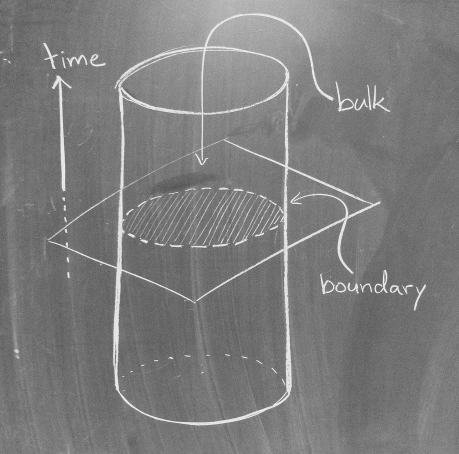 Conveniently, in this picture you can think of the corresponding CFT as living on the boundary of the cylinder, which, you should note, has one less dimension than the “bulk” inside the cylinder. Even within this nice picture of holography that we get from the AdS/CFT correspondence, there is a question of how exactly do CFT, or boundary quantities map onto quantities in the AdS bulk. This is where a certain tool from quantum information theory called tensor networks has recently shown a lot of promise. Beni discussed one type of tensor network in his post on holographic codes. In this post, let’s discuss the tensor network shown above, which is known as the Multiscale Entanglement Renormalization Ansatz, or MERA. The MERA was initially developed by Guifre Vidal and Glen Evenbly as an efficient approximation to the ground state of a CFT. Roughly speaking, in the picture of a MERA above, one starts with a simple state at the centre, and as you move outward through the network, the MERA tells you how to build up a CFT state which lives on the legs at the boundary. The MERA caught the eye of Brian Swingle, who noticed that it looks an awfully lot like a discretization of a slice of the AdS cylinder shown above. As such, it wasn’t a preposterously big leap to suggest a possible “AdS/MERA correspondence.” Namely, perhaps it’s more than a simple coincidence that a MERA both encodes a CFT state and resembles a slice of AdS. Perhaps the MERA gives us the tools that are required to construct a map between the boundary and the bulk! So, how seriously should one take the possibility of an AdS/MERA correspondence? That’s the question that my colleagues and I addressed in a recent paper. Essentially, there are several properties that a consistent holographic theory should satisfy in both the bulk and the boundary. We asked whether these properties are still simultaneously satisfied in a correspondence where the bulk and boundary are related by a MERA. What we found was that you invariably run into inconsistencies between bulk and boundary physics, at least in the simplest construals of what an AdS/MERA correspondence might be. This doesn’t mean that there is no hope for an AdS/MERA correspondence. Rather, it says that the simplest approach will not work. For a good correspondence, you would need to augment the MERA with some additional structure, or perhaps consider different tensor networks altogether. For instance, the holographic code features a tensor network which hints at a possible bulk/boundary correspondence, and the consistency conditions that we proposed are a good list of checks for Beni and company as they work out the extent to which the code can describe holographic CFTs. Indeed, a good way to summarize how our work fits into the picture of quantum gravity alongside holography and tensors networks is by saying that it’s nice to have good signposts on the road when you don’t have a map. 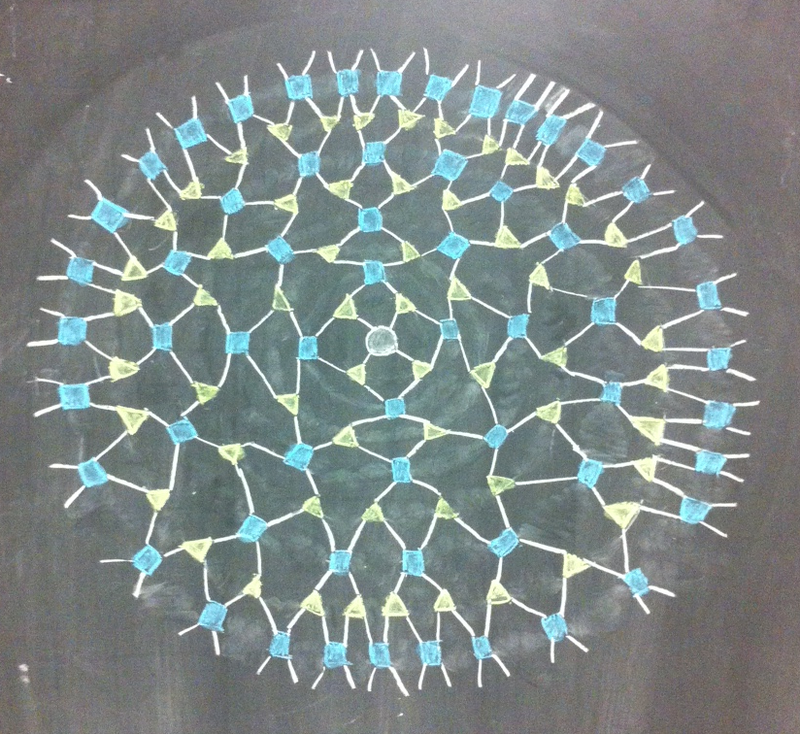 This entry was posted in Real science, Theoretical highlights by Aidan Chatwin-Davies. Bookmark the permalink. Shtetl Optimized’s column this week “Can Quantum Computing Reveal the True Meaning of Quantum Mechanics?” includes multiple quotes, links and comments that are directly relevant to this Quantum Frontiers essay “Holography and the MERA”. One practical consequence of this reasoning is that high-precision measurement technologies (ion-traps and BOSONSAMPLERS for examples) should deploy superconducting shields to prevent decohering electromagnetic entanglement of the internal apparatus with external cosmological horizons, so as to eliminate the possibility of exploiting that decoherence in PTIME computational unravelings as simulations of AdS/MERA dynamics. Thi shielding strategy — realized as superconducting inflatable lead-foil bags — was deployed by Gravity Probe B to classically decouple its internal gyroscopes from external electromagnetic influences. Yet even this classical decoupling proved far tougher to realize than the Gravity Probe B designers anticipated. Nowadays ion-trap and Josephson-junction qubit designers similarly wrestle with unanticipated (and at present, poorly understood) decoherence mechanisms that originate in the conduction bands (both normal and superconducting) of electromagnetic shielding that is designed to prevent such decoherence. That’s why it’s far from evident that any QED-based shielding technology suffices, even in principle, to decouple instruments from the electromagnetic and gravitational cosmological vacuum sufficiently for scalable quantum computing and un-simulable BOSONSAMPLING experiments. The principle of “Hamiltonian Egality” — as postulated implicitly by canonical textbooks like Nielsen and Chuang’s Quantum Computation and Quantum Information — “solves” this problem by implicitly postulating that effective Hamiltonian systems can be realized that are entirely decoupled from the cosmological event horizons. But realizing this decoupling proves to be far harder than postulating it. Alternative A AdS/MERA-mechanics is physically a good practical approximation of (Nature’s exact) Hilbert-dynamics. Alternative B Hilbert-mechanics is mathematically the universal and natural resolution of (Nature’s exact) AdS/MERA-dynamics. Alternative “A” affirms that because AdS/MERA-mechanics is only an approximation to exact Hilbert-dynamics, scalable quantum computing and un-simulable BOSONSAMPLING experiments both are achievable. In diametric opposition, alternative “B” afforms that because Hilbert-mechanics is only an AdS/MERA resolution, scalable quantum computing and un-simulable BOSONSAMPLING experiments both are infeasible. How to decide between “A” and “B”? These alternatives present young quantum-researchers with precisely the choice that Scott’s PBS/NOVA essay spotlights, in arguing that: “In choosing a picture of physical reality, we should be loath to posit computational effort on Nature’s part that vastly exceeds what could ever in principle be observed”. In a nutshell, the reasoning of Scott’s PBS/NOVA reasoning strongly favors alternative “B” … even though the thrust of most Shtetl Optimized essays strongly favors alternative “A”. Needless to say, this unrelieved A-vs-B tension — which the entire quantum research community shares — makes for terrific STEAM discourse that points toward rich research opportunities. Conclusion Nature restricts quantum Hamiltonians to a cosmologically-coupled subset (namely, field-theories that couple to massless gauge bosons) that makes scalable quantum computation extraordinarily difficult to realize … perhaps even impossible. The good news is, this same subset of cosmologically-coupled quantum Hamiltonians suffices for all of human biology and all (present) human technologies … and is proving to be extraordinarily easy to computationally unravel. With a great amount of theoretical, experimental, and pedagogical work still to be done, one reliable conclusion is that young quantum researchers not apprehend a prolonged “Quantum Computing Winter” … not with with vibrant ideas like S-Sourcery, AdS/MERA, and MERA-mechanics on the table! MERA is an impressive picture for emergent spacetime. But, if the emergent spcetime is physically meaningful, entire spacetime should be emergent, not just a radial direction of AdS space. In other words, holography must be everywhere, not just codimension one only. Even in AdS/CFT correspondence, we have to recall that the emergent space includes the five-dimensional sphere as well as the radial direction of AdS space, although S^5 is shrinking to a point at conformal boundary of AdS space. I am not sure how MERA can realize the emergent five-dimensional sphere as well as the radial direction of AdS space. I want to remark that there is a beautiful way to realize the holography everywhere by considering a noncommutative (NC) space. As we learned from quantum mechanics (NC phase space), the NC space introduces a Hilbert space which may also offer some mechanism for the construction of spacetime MERA. More important feature due to the existence of the Hilbert space from the NC space is the realization of the duality between the algebra (gauge theory side) and the geometry (gravity side). This remarkable duality is an inevitable consequence of the NC space as quantum mechnics has taught us so far, although we are stupid to have ignored this important lesson. The guiding ideas behind the MERA (Multi-scale Entanglement Renormalization Ansatz) help us to appreciate MERA as a concrete realization of Gil’s “noisy low-degree polynomial dynamics”, per research presented by Brian Swingle and colleagues at last month’s KITP conference Closing the entanglement gap, in Swingle’s “S-Sourcery” talk (thanks are extended to John Preskill for tweeting a link to this talk). Swingle’s talk builds on the work in the preprint “Area Law for Gapless States from Local Entanglement Thermodynamics” (arXiv:1505.07106) by Swingle and John McGreevy. This talk is essentially optimistic. What I want to convince you of is that the ground state problem … that is, you give me the Hamiltonian, I give you the physical properties … is solvable, at least for some large class of systems. Now we know it can’t be true for every system that you can solve it, but I want to convince you that for a large class systems, it is in fact solvable. Here ‘solvable’ can mean many things, one things it means is that I put the Hamiltonian on a computer and calculate ground-state properties in a time which scales polynomially with system size, not exponentially. So in other words, the exponential complexity of Hilbert space can be tamed. In particular, the Kalai/Swingle/MERA postulate that “the exponential complexity of Hilbert space can be tamed” is justified (in Swingle’s work) by arguments that apply generically to all quantum dynamics systems that arise from long-range gauge-theoretic dynamics. Which is to say, from an engineering perspective, the arguments for the Kalai/Swingle/MERA postulate apply to all physical systems that we humans can realize in our laboratory. Conclusion Even if the Kalai/Swingle postulate that “the exponential complexity of Hilbert space can be tamed” is demonstrated in coming decades to be false (by scalable quantum computers and/or BosonSamplers for example) young researchers can learn plenty of valuable mathematical skills, and perhaps find career shelter from the “Quantum Computing Winter” — the ongoing winter of stagnant funding and diminished career prospects — by careful study of the deep and still-mysterious algebraic grounding of the Kalai/Swingle/MERA postulates.